Oregon didn’t make many plays down the stretch last week and it got swept in Los Angeles. But tonight, the Ducks made just enough plays in the last few minutes to hold on to a 75-68 win over Arizona State. With the win, the Ducks moved to 18-10 overall and 8-7 in league action. The Sun Devils dropped to 19-8 overall and 7-8 in Pac-12 play. Oregon also completed the regular season sweep over ASU with a win in Tempe earlier this year. Elijah Brown led the way with 19 points, including a 10-0 run by himself that spanned the two halves. Mikyle MacIntosh added 16 with Paul White scoring 11. Payton Pritchard stuffed the staff sheet with nine points, six assists and five rebounds. Kenny Wooten also made his presence felt on the defensive end with four blocks and a whole host of altered shots. 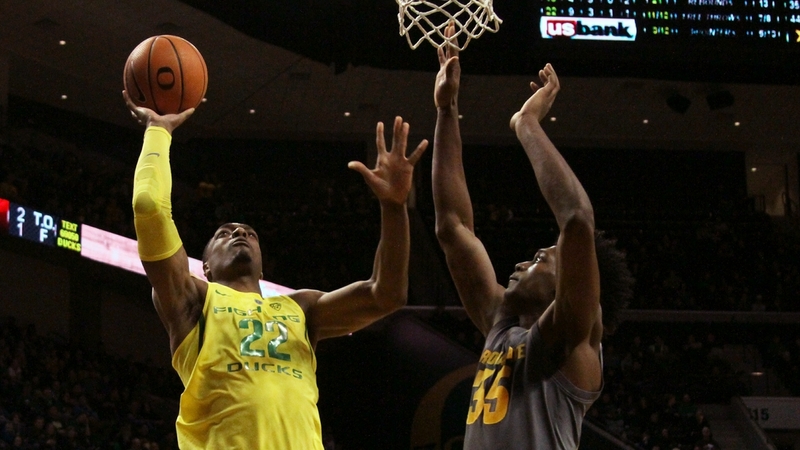 The Ducks also killed ASU in the paint, outscoring the visitors 36-14 near the hoop. It was a clean game for the young Duck team as they committed a season-low seven turnovers. Both teams went back and forth in the first half before Oregon took a three-point lead at the halftime break at 43-40. Arizona State enjoyed a seven-point lead early, but the Ducks came storming back thanks to a successful press. Oregon turned that deficit into a six-point lead until the Sun Devils tied the game up at 40-40 with 30 seconds left. Brown’s corner three found the mark to give the Ducks momentum heading into the second half. Now the Ducks will need to prove this win wasn’t just a flash in the pan as No. 14 Arizona comes to Eugene Saturday. The Wildcats are coming off an overtime win over the Beavers, but might be missing their second-leading scorer Allonzo Trier, who was suspended by the NCAA for testing positive for a banned substance. Arizona has appealed the suspension, so it’s unclear whether Trier will be available to play against the Ducks as of yet. © 2017 DuckNews.com. All rights reserved.